With a population of just under 11,000 Pembroke Parish is the most populated area of the island. It is centrally located and encompasses the capital; the City of Hamilton. It is named after William Herbert, 3rd Earl of Pembroke (1580 – 1630). The City of Hamilton lies within Pembroke. Most of the restaurants and attractions in Pembroke lie within the borders of the city and are covered in more detail in our guide to Hamilton. All hotels (including the Fairmont Hamilton Princess) lie within Pembroke but outside the borders of Hamilton. All can be reached on foot from the capital in just a few minutes. Pembroke Parish offers a good selection of hotels and places to stay. All are located just west of the City of Hamilton. The Fairmont Hamilton Princess is the largest hotel in the area and caters mainly to business travellers. It’s situated on Pitts Bay Road, close to the offices of many of Bermuda’s international businesses. In September 2012 the waterfront property was purchased by the Green family. Work on a $70 million redevelopment project is due to commence at the end of 2013. It will include a new marina, a larger pool area, a new restaurant, and room renovations. Oxford House is the closest hotel to the city centre. The two-storey guesthouse is run by Welsh-born Ann Smith and offers 12 rooms. Hamilton can be reached on foot from any of these properties in about 10 minutes. Places to visit in the City of Hamilton include the Bermuda National Gallery, Bermuda Historical Society Museum, Queen Elizabeth Park, the Perot Post Office, and Bermuda Cathedral. Fort Hamilton lies just east of the capital and is well worth exploring. It was built by British in the late 19th century at a time of rising tensions with the United States. The fort is well preserved and features well-kept gardens, a moat, and ramparts with excellent views of the capital and Hamilton Harbour. The Bermuda Underwater Exploration Institute is also on this side of Pembroke. This modern facility houses a variety of exhibits exploring the underwater world including treasure recovered from shipwrecks, a collection of beautiful shells, and a replica of Charles Beebe’s Bathysphere. Pembroke Parish isn’t home to any popular beaches. Clarence Cove is here but it’s small and rarely visited by tourists. It lies within Admiralty Park, around two miles west of Hamilton. Spanish Point Park lies at the western tip of Pembroke Parish. In 1603 a Spanish galleon commanded by Diego Ramirez ran aground on the reefs nearby. The crew stayed in the area for several weeks to carry out repairs and then continued on their voyage. A few years later the island was colonised by the British. The first settlers found remnants of the Spanish camp and named the area Spanish Point. The park is a pleasant spot for a picnic or walk. Just off the shore you’ll notice what looks like a shipwreck. It’s actually the remains of a huge floating dock, built in England in the 1860s and towed to Bermuda. At the time it was the largest dry dock in the world. By the early 1900s was too small to accommodate the newer ships and was decommissioned. Anybody can play tennis at the WER Joell Tennis Stadium. The government-run facility offers 8 courts for hire at reasonable prices. There’s also a tennis court (free) at Admiralty Park. Most of the restaurants, bars and pubs in Pembroke Parish are situated within the borders of Hamilton. They include the Barracuda Grill, Bistro J, Chopsticks, Docksider, Flanagan’s, the Hog Penny, the House of India, La Trattoria, Little Venice, the Lobster Pot, L’Oriental, the Pickled Onion, Port O’ Call, Portofino, and Rosa’s. 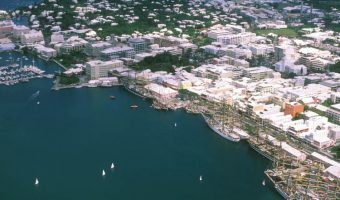 Hamilton is Bermuda’s main transport hub. All public bus and ferry routes begin here. The main bus station is on Church Street (next to City Hall). The ferry terminal is located at the western end of Front Street (near the HSBC Bermuda building). Bus route 4 serves the Spanish Point area of Pembroke Parish (for Admiralty House Park/Clarence Cove and Spanish Point Park). It should be noted that the service on this route finishes quite early in the evening (see our simplified bus schedule). There are two scooter rental shops in Pembroke; Oleander Cycles on Gorham Road and Smatt’s Cycle Livery on Pitts Bay Road (outside the Fairmont Hamilton Princess). There is a taxi rank outside the Fairmont Hamilton Princess. There are also taxi ranks in Hamilton (on Front Street and Church Street). You can hire a horse and carriage on Front Street in Hamilton. Tours leave the capital and head west into Pembroke Parish. Butterfield has ATMs at Gorham’s on St John’s Road, at the RUBiS East Broadway Service Station (near the BUEI), and at the Waterfront Banking Centre (near Miles Market). More ATMs can be found in Hamilton. The only post offices in Pembroke Parish are in Hamilton (the Perot Post Office and the General Post Office). Interactive map of Pembroke Parish. Click on any icon for further information. Well-maintained fortress on the outskirts of Hamilton. Offers great views of Hamilton Harbour.